Gram for gram, the adrenal glands receive more blood flow than any other part of the body–including the heart and the brain. The body is an efficient machine, so this relatively massive dedication of blood flow is an indication of how important these often tiny organs are. Theysit on top of your kidneys weigh in at a mere 3-5 grams each and measure are 1/2″ tall and 3″ wide. 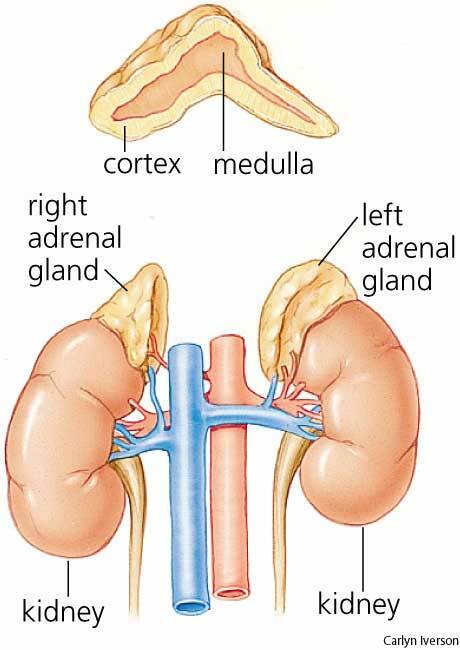 Your adrenal glands have two layers that secrete different sets of vital hormones. The outer layer of the adrenal gland (the adrenal cortex) secretes steroid hormones which are made from cholesterol. Cortisol is, by far, the major hormone product of the adrenal cortex. It is called a “glucocorticoid” because of it’s effects on raising blood sugar (glucose). Healthy cortisol levels have a “diurnal” cycle, with normal levels being highest around 7AM and lowest levels occurring around midnight. This morning cortisol boost is intended to wake you up with plenty of blood sugar and blood pressure. If you wake up feeling unrested, groggy and wrecked there may be a problem with your sleep or your Adrenal glands may be fatigued or exhaustred. That’s what this article is about.